This spring, I started a wheat breeding project. I had originally contemplated a grid, and record keeping. In the end, I just dumped all the seed together in a bag, shook it up, and planted. 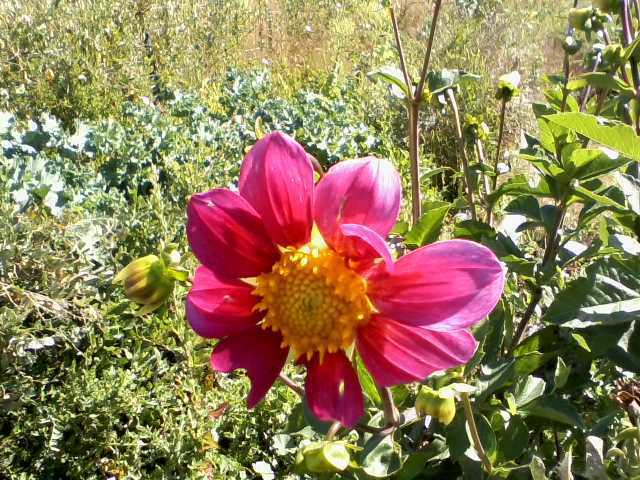 Dahlias grow about equally well whether I direct seed them, or grow seedlings for transplanting. Transplants may be a bit easier, because they don't get lost so easy in the weeds. I really like growing dahlias from tubers... After the 2017 growing season, I put enough tubers into the root-pit to grow 150 pounds of dahlias for my favorite restaurant. Alas, they didn't survive the winter. My local dahlia guru tells me to store dahlia tubers indoors, in dry peat, in plastic bags with a few holes poked in the bags with a pencil. 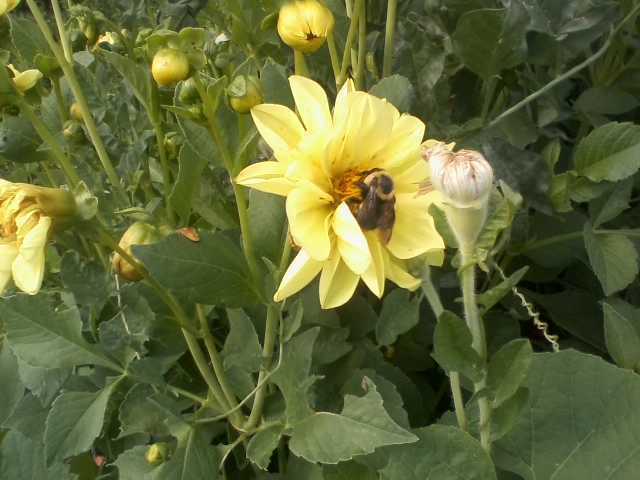 For plant breeding, I prefer dahlias with simple flowers that are readily pollinated by insects. I entertained the fantasy that these would be split, replanted, and produce enough tubers to feed my community. They were the two best roots to emerge from my breeding project. Non-fibrous. No-funky flavors or aromas. Alas, they didn't survive the farmer's habits. We typically eat dahlia tubers in the same way that water-chestnuts are eaten. Something to add a bit of crunch to a soup, stirfry, or roast. I typically eat only the flowers of daylilies. Raw in the field. They are called daylily for a reason... The flowers are ephemeral, therefore it's hard to pick them and get them home to make into a meal. Sorry that the server was down for an extended period of time today. We are aware that there are issues affecting this server. We are working to get them resolved. Update @ Mon Apr 1 10:16:00 MDT 2019 - This server is being rebooted to restore service. Upon reboot a file system integrity check has been forced. Update @ Mon Apr 1 10:31:00 MDT 2019 - The file system integrity check is 27% complete. Update @ Mon Apr 1 10:53:00 MDT 2019 - The file system integrity check is 58% complete. Update @ Mon Apr 1 11:23:00 MDT 2019 - This server is up and available for use. I attended the NOFA-NY seed conference this winter. One of the plant breeders was telling about tomatoes that he is working on that have like 20 different resistance genes built into them. I wasn't paying much attention, cause that's not my way, but I seem to remember that the seed is commercially available. Plant Breeding / Re: Sunflower - Giant Russian. For me, lodging is most commonly associated with the stem snapping off a few inches above ground level. Sometimes, they will lodge by the roots pulling out of the ground. I'm not doing much selection against leaning over, as long as the head stays off the ground. I grew up with sunflower disks that were extremely hard to shell. I was super-startled the first time i encountered the easy shelling trait. It immediately became a primary selection criteria. The goldfinches here love sunflower seeds, and hanging upside down to eat, but they haven't figured these out (yet). I might have seen a titmouse once. They are not common at all around here. Last year, only one head was missing some seeds due to bird predation. The disk was bowed, rather than flat. Richard: Some years ago, you mentioned the benefit of heads pointing straight down. As a result, I adopted that same strategy in my sunflowers. Sure keeps the birds off them. I haven't been paying attention to seed color in my giant sunflowers. 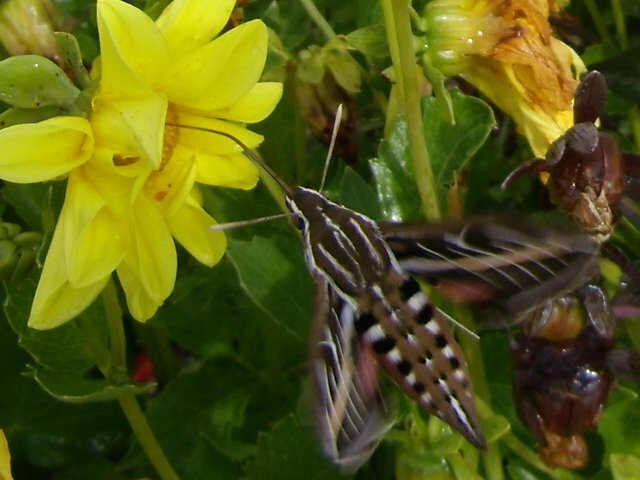 They are mostly black, with occasional striped seeds. One of the most important traits to me has been ease of shelling. I like to go out into the field, while the heads are still damp, and rub the seeds, and have them easily fall from the disk. It's much easier for me to dry seeds than it is to dry disks. Especially in cool/damp fall weather. I am selecting for larger disks, and thicker stalks. Seems like they are kinda related. 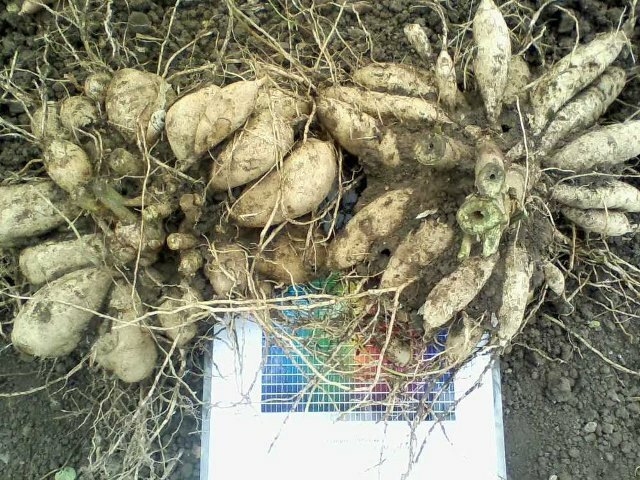 Sweet potatoes seem like one of the most genetically diverse species that I have worked with. In other words, the best answer I can provide is: It depends. I have had sweet potatoes that flower all summer long. Gloriously flowering things, and others that don't flower at all. My primary selection criteria for any breeding project is seediness. The plant has to produce seeds for a breeding project to exist at all. After I can reliably grow seeds, then I'll start selecting for other traits. I thought that I would try recreating the Egyptian Onion cross by interplanting Allium fistulosum and Allium cepa. They flowered at completely different times. So to attempt the cross, I'd need to store pollen, or shift the flowering times. My A cepa are a genetically diverse landrace, so there is diversity in flowering times. The A fistulosum were an inbred variety, so I might explore different cultivars of A fistulosum that might flower at different times. It is said that Allium canadense has 14 sets of chromosomes, and that Allium cepa has 16 sets. Different numbers of chromosomes generally makes inter-species crossing very difficult. I am also selecting sweet potatoes for storage under conditions which are available to me. Which means inside a closed cardboard box in an unheated (above 60 F) bedroom. Is there a possibility to grow wild species on your land that are highly lucrative as wildlands seed? One of the side-projects that I expect to emerge from the Beautifully Promiscuous and Fruity Tomato project is tomatoes with huge decorative flowers and unusual foliage. If that happens it will be both edible and decorative. I get a lot of comments from people that they are keeping my dried beans (sold in glass jars) as decorations in their kitchens rather than eating them. Mixes of species work very well for decorative purposes. That seems like too much labor to grow compared to corn or poppy seed heads. Ha! I bet that I could sell corn seed in jars, as a decoration, rather than as food, and get much higher prices. Aloe vera, and cactus can grow for years in the same pot. Breed Your Own Vegetable Varieties lists two references for crossing rate in lima's: a) 0-80% by bees. b) less than 18%. Lima beans are one of those species that barely survives on my farm. Here's what my entire 2018 harvest looked like. I've grown two generations of seed so far without weeding. That's encouraging.